After you have created your presentation, you may need to present it on a different computer. This different computer may not have PowerPoint installed, or it may not have the fonts that you used in your presentation. You have to prepare the presentation for distribution by marking it as Final. This will also prevent the file from being editing by someone else. This process also works in PowerPoint 2013 & 2010. Step 1:Create the PowerPoint presentation and save it. Step 2:Click the File tab and then Info. 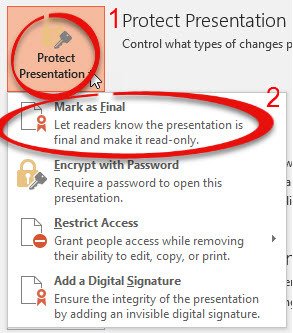 Step 3:Click the button labeled Protect Presentation and choose Mark as Final. Step 6:Note the Marked as Final banner.